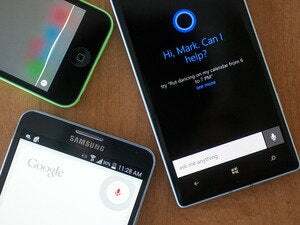 Microsoft continued to tie its Maps app to its other platforms, including Windows Phone, with recommendations and plans to more closely integrate it with its Cortana digital assistant. With its Wednesday update, Microsoft seems to be most proud of the fact that if you save a Favorite location within the Bing Maps app for Windows 8, that preferred place will be saved to the cloud and will roam with you to other platforms. If you search within the app, Microsoft said, Bing displays your past searches for places and addresses, as well as places you may have already saved as favorites. Microsoft has also added a search box, a tacit admission that users weren’t swiping right to open the Search charm. 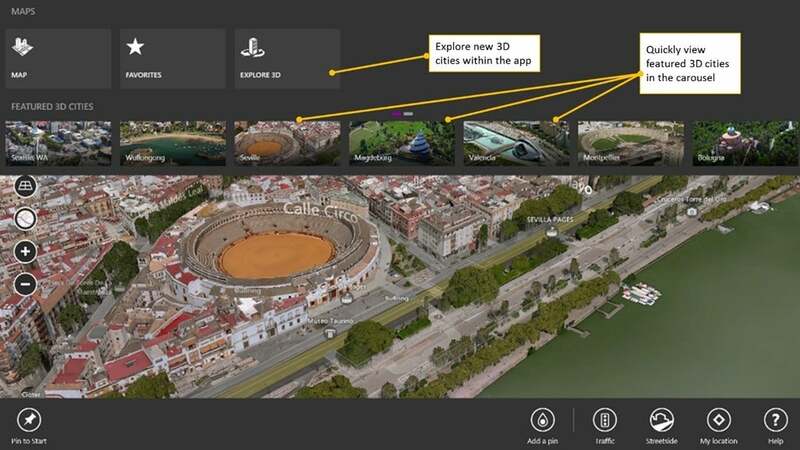 And more cities are available to explore in 3D, as Microsoft began last December. The key, however, may be the new recommendations that Microsoft has added. Pick a location, look for nearby coffee shops or hotels, and Bing will tap into both Yelp and TripAdvisor for local recommendations. (TripAdvisor, especially, is one of my preferred services for selecting hotels.) Google, by contrast, can tap into reviews from gayot.com and others, but it doesn’t use either Yelp or TripAdvisor for its reviews; instead, it culls opinions from its Google+ social network. With its May 2014 update to Bing Maps, Microsoft has made 3D explorations of world cities easier than ever. Google, however, does an exemplary job of peering through your email and deducing your travel and hotel itinerary—with your permission, of course. On a recent trip to New York, for example, Google’s Google Now cards gave me real-time flight information, auto-generated a QR code for gate personnel to scan, and offered me directions and travel times to my hotel—all without my lifting a finger. With Bing, you’ll need to search manually for your hotel and tag it as a favorite, labeling it as “My Hotel.” A future Windows Phone app update will then allow you to ask Cortana how long it will take to walk to the “My Hotel” favorite location. Microsoft also assumes that users will dive into its Bing Search app, rather than use the more common method of finding information—the Web. 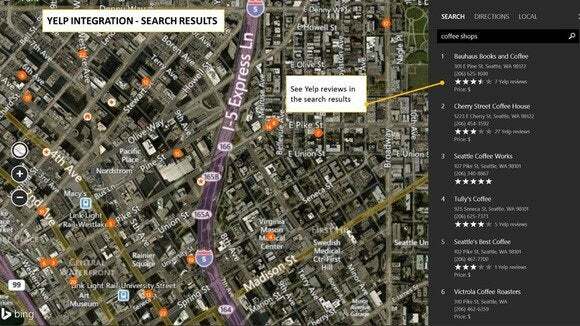 So far, the search box is available within the Bing Maps website, but the Yelp/TripAdvisor recommendations are not. For those who want to use mobile-style specialized apps to search on a PC, the new Bing updates will be helpful. Otherwise, Microsoft will need to shore up its cross-platform Maps strategy to include the Web.